I apologize for the delay, but here is last week’s book! My friend Shannon was the first one to recommend this book to me. She said that Asher had a great style for writing from alternating points of view, which is something I was working on at the time. She said the book’s storyline itself was great and it was an addicting read, which I later found out to be true. When I picked up the book and started to read it, I found the concept of the story completing enthralling. I wanted to hear Hannah’s story just as much as Clay did. In short, the story follows a boy named Clay as he spends the night listening to 6 cassette tapes that play the thirteen reasons why Hannah Baker committed suicide. The tapes take him through thirteen stories or events involving 12 different people. Hannah also leaves Clay with a map that has been marked with some of the places where these events have taken place. After Clay listens to all the tapes he has to pass them on to the person who comes after him chronologically in the story telling. The story opens with Clay sending a package before moving onto to chapter one where Clay explains from the beginning about the shoebox full of tapes. The shoebox package arrive on Clay’s front porch one day and he is eager to open it–only to find a set of 6 tapes inside. He goes into the garage and plays the first tape. This is when the reader first hear’s Hannah’s voice. It is chilling to think of sitting down listening to someone’s voice who has passed away–even more chilling when that person is someone you knew and someone you cared about. Asher takes the reader on a ride of emotions felt both by Clay and Hannah. You learn who Hannah is from herself and you learn about Clay and his feelings about Hannah. The reader gets shone a side of a story many people don’t know or get to experience when dealing with such a topic such as suicide. Asher was a genius with his storytelling. He showed the reader just how one event can snowball into something far worse because of the rules and ways of society. He was able to make the reader connect with both Hannah and Clay as characters. I haven’t read a book as fast in quite a while. This book will leave different impressions on you as a reader depending on your own experiences. This topic and book touched a little closer to home for me than I would imagine it would for others. If you are a reader outside the early teens to young twenties age group, you might not find the book as compelling. However, I think it’s definitely a story that should be read in this day and age with so much animosity among young people. The book has its semi-graphic points so I wouldn’t really recommend the book for anyone under 13. It is a tough topic to immerse yourself in, but it’s definitely worth the read! Even from a writer’s point of view, I think you could learn a few techniques from Asher’s writing style. As I mentioned in the beginning of this post, I wanted to work on writing from alternating points of view and I think Asher did this creatively and successfully. As with some of the previous books that I’ve read so far, this book is also rumored to be turned into a movie. I’m interested to see the outcome of the on screen rendition and I wonder what rating they will put on the movie–how much they are going to show. The book also spurred the author to start the Thirteen Reasons Why Project for fans to express how the book effected them. Overall, I would recommend reading this book if you can. Weather for the storyline or the writing techniques, I feel this book would be a good investment of your time. I really enjoyed reading it and really loved the characters Asher presented. Although Thirteen Reasons Why seems to be a hesitant topic, I believe it’s a really great story that should be shared. This has been my favorite read so far out of my 52 in 52 list! Have you read Thirteen Reasons Why? What do you feel about stories on touchy topics? 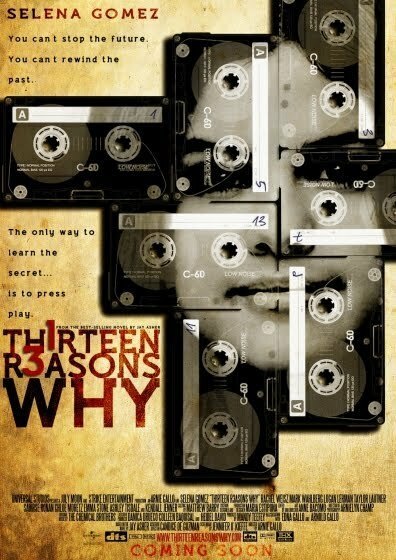 How do you feel about Thirteen Reasons Why becoming a movie?